Everything you wanted to know about a MotoCaribe Tour, but were afraid to ask! “MotoCaribe was founded in 2007 on a simple premise that guides all we do today: to offer all riders worldwide the greatest value in supported, exotic motorcycle tours on the planet, period. If you have a question not listed, send us a note and you’ll get a quick answer. 1. What Makes MotoCaribe Touring Different? Somehow the adventure has been lost along the way with other touring companies. While our riding is amazing, we do more than ride. We adventure. Yes, a passport is required. 3. Do I need to visit a doctor before visiting? It is always a good idea to consult your physician before traveling, although for the regions you will be visiting bug spray should be sufficient. Please consult the link below for more information. 4. Should I purchase travel insurance? It is always advisable to purchase travel insurance before a trip. http://www.insuremytrip.com is a great starting point to find the policy which is right for you. 5. Which airport do I fly into? Fly into Santiago, airport code STI– the best time to arrive is between 11:00am and 2:30pm but flights outside that window are fine. Puerto Plata (POP) and Santo Domingo (SDQ) are options, but there will be a transfer fee per van load. STI is easily accessed through New Your City, Boston, Newark and Miami. 6. How do I get from the airport to the MotoCaribe home base? MotoCaribe will pick you up in our tour van. 7. How will I get back to the airport after finishing the tour? MotoCaribe will take you to the airport after the conclusion of the tour. Your warm weather mesh riding jacket and riding over pants. Lightweight rain gear, your riding boots, riding gloves and protection. We believe in ATGATT (All The Gear All The Time). Under your riding gear we recommend bringing a few wicking tee shirts and shorts. We make stops at some amazing places where you can take a swim. Peeling off your riding gear quickly with the ability to get wet, and then dry off quickly, makes the stops along the way more enjoyable. Casual clothes for night time, a baseball hat because the sun is bright, a bandana to cover the back of your neck while riding, bathing suit. Any prescribed medication, bug spray (Orange OFF! is perfect), sunscreen, hand sanitizer and personal toiletries. A backpack or a small sized magnetic tank bag to store things on the bike. You will have use of a round leather barrel tail bag while on tour. NOTE: We try to take video of most segments of the ride with a GoPro Hero3 Black. If you’d like a copy of the raw video, bring a larger USB stick or SSD card and we’ll put copies of the raw video flies on it. 9. What type of motorcycles does MotoCaribe provide? 10. What enhancements have been done to the motorcycles? Givi engine guards, Fenda Extenders, swing arm spools and small leather tail barrel w/rain cover. 11. What is the seat height on your motorcycles? 32 inches is the stock seat height. Bikes can be lowered to 31 inches. 12. Do I have to pay for gas in my motorcycle? No, fuel is included for the entire tour. 13. How do I transport my luggage? 14. Do you provide helmets? Yes, we have DOT modular flip-up type helmets available from Small to XXLarge for use during the tour. However, most prefer to bring their own helmet. 15. How many miles per day will we be riding? On average 120 miles per day. A good rule of thumb in the DR is that 100 miles feels more like 300 because of the riding environment and scenery. 16. What is the weather like in the Dominican Republic? It’s tropical with an average year round temperature of 84 degrees. Occasional rain is typical in the region. Lower humidity and cooler temperatures can be expected in the mountains. 17. What are the accommodations like? Generally king or queen size bed, a/c, cable TV, and showers with hot and cold water. The accommodations are upscale, clean and comfortable. If you’d like we can provide coffee pots and supplies in your room, as well as bottled water for the entire trip. 18. What parts of the Dominican Republic will I tour? On the North Coast Tour we start out in the mountain town of Jarabacoa in the Cordillera Central region, and then ride out to the Samana Peninsula. On the South West Tour we start out in the mountain town of Jarabacoa in the Cordillera Central region, and then ride to the South West as far as Bahia de Las Aguilas. On the East Tour, we start in Jarabacoa then head southeast to Bayacanes, to Sabana de la Mar, southeast to Bayahibe, then west to La Romana & Juan Dolio. Combination tours cover two regions. 19. In which resorts will we be staying? When available you will stay at Gran Jimenoa Hotel in Jarabacoa, Grand Paradise while on the Samana Peninsula, Hotel Las Salinas in Las Salinas and Costa Larimar in Barahona, Playa Esmeralda in Bayacanes, Paraiso Caño Hondo in Sabana de la Mar and Be Live Resort in Bayahibe. 20. Will I have to buy my own meals? No, breakfast, lunch, dinner & snacks are provided every day during your tour. 21. What is the food like in the Dominican Republic? Breakfast typically is scrambled eggs, fresh fruits, pancakes, breakfast meats and cheeses, fresh squeezed juices, and wonderful coffee. Lunch will be authentic Dominican fare, chicken, pork or fresh fish, rice and beans, green salad, French fries. Dinner is also authentic Dominican fare, chicken, pork, soups, salads and potatoes prepared different ways. Plantains are common with all meals. Meals in resorts are usually buffet-style. 22. Is the Dominican Republic safe? Yes, especially the areas we will be traveling in. Like anywhere in the Caribbean there is crime in the DR, but mostly confined to the large cities which we intentionally avoid. 23. Does the tour take us close to Haiti? We may cross the Haitian border on the South West tour for a short visit into a busy commercial market in Jimani. The visit is very safe and there are numerous police and UN soldiers within sight. This is often a highlight of the tour. The visit is very controlled and safe, and pictures and videos are encouraged. 24. Will I have my own room? Yes, all accommodations are private. 25. Will I need to be fluent in Spanish? No, our tour manager is Dominican and she will act as the interpreter during the tour. Robert has some, but limited, Spanish. 26. Will I have cell phone service in the Dominican Republic? That depends on your provider. Check with them if service is available for your phone. Call rates can be expensive; often times it is helpful to upgrade to an international package for the duration of your stay. The Tour Manager & Lead Rider have active local cell phones if needed. 27. Will I have access to the Internet while on Tour? Internet access is usually available in your hotel, but service can be inconsistent. 28. How many other riders will be on the tour with me? The maximum number of guest bikes for the tour is 7. 29. What are the road conditions like in the Dominican Republic? It ranges from smooth tarmac to hard packed dirt; all routes are within the capabilities of the bike and the skills of the group. 30. How much off road riding will I be doing? Very limited. Typical off road is when we are going to an attraction. This is mostly hard packed with some gravel and not considered technical. 31. Will I be riding by myself? No, we always ride together as a group, with the lead MotoCaribe rider at the front and our support van and trailer at the rear of the group rarely more than 10 minutes behind. 32. Will we be riding at night? 33. What are the traffic conditions like in the Dominican Republic? Our routes take you from sparsely populated mountain village roads to small congested towns with small motorcycle (moto), car and truck traffic. We intentionally avoid big cities. It takes the typical rider a few hours to adjust to traffic on the roads. There are 2.5 million registered vehicles in the Dominican Republic, and 1.8 million of those are motorcycles. Drivers are much more aware of motorcycles simply because they are everywhere. Our extensive pre-tour orientation covers the rules of the road derived from thousands of miles riding safely in the DR. MotoCaribe will make sure you are comfortable and confident before the tour begins. 34. What does the Tour Manager do? The tour manager handles all the arrangements and logistics while on the tour and will serve as translator during the tour. She makes sure you can focus on riding and having fun. 35. How many stops per day will we make? It depends on the day, but we usually ride for no more than 1.5 hours between stops. 36. What is the purpose of the tour van/support trailer? The van provides the option of not riding on a specific day. It also allows you to bring non-riding family members or friends along on the tour, as well as maintenance equipment, food and luggage. The van is also available for any nighttime excursions. The support trailer carries the spare motorcycle and maintenance items. 37. Do I have to ride every day? No, you may choose to opt out of riding on any day of the tour. 38. Will I have to wrench on my own bike? No, we can make any adjustments you need before/during the tour. 39. Who owns the motorcycle I will be riding? MotoCaribe owns all bikes used on the tour. 40. Will I have to sign a waiver before riding? Yes, we require you to sign a standard waiver of liability. 41. Should I make a color copy of my passport and drivers license before I arrive? Yes, that is always an advisable practice when traveling internationally. We suggest that you copy and laminate the face page of your passport & drivers license to carry with you and keep dry. The original can be safely stored off the bike. 42. What time is breakfast in the morning? We aim to be on the road generally around 8:30am, breakfast is usually between 7:30 and 8:00AM. 43. What time is lunch? Depends on the day and the timing of the stops, but usually between noon and 1:30pm. Snacks are included and may be carried in your tail bag or are also available from the support trailer at all stops. 44. What time is dinner? Again, it depends on the day but usually around 7:00-8:00PM. 45. What is the currency of the Dominican Republic? 46. Will I be able to change money upon arrival? Yes, the MotoCaribe tour manager will be able to exchange your currency. Also, you can PayPal money in advance and we will have it for you upon arrival. 47. I have never ridden a Suzuki V-Strom 650, what is it like? It’s one of the most versatile and durable bikes ever made, absolutely perfect for the tour. 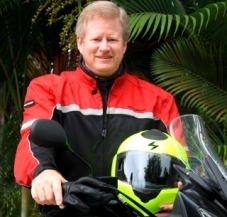 We have had numerous guests purchase a V-Strom after their tour. 48. What types of activities will be doing? Besides epic riding, you’ll be swimming, hiking, horseback riding, snorkeling, beachin’ it and having the time of your life! The DR has a diverse ecosystem and a wildly varying landscape; MotoCaribe’s activities are designed for you to experience the natural beauty of this unspoiled paradise. 49. How do I pay for my tour? A $400 deposit per guest reserves your tour seat. The balance is due 2-weeks before the start date of your tour. Payments are made via PayPal unless other arrangements are approved in advance. 51. What is your refund policy? Full deposit refund if you cancel more that 30 days prior to the tour date. A credit of your deposit will be applied to a future tour if you cancel within 30 days of your tour. The deposit is transferable. 53. What is the damage deposit? We require a $300 cash deposit against damages to the motorcycle, and your maximum damage liability is $500. This deposit is immediately refunded at the end of the tour if the motorcycle has no damage. The damage deposit can be made in cash at time of signing of the Waiver, or paid in advance. 54. Can my family get in contact with me while on tour? Yes! Prior to your tour date we will send you contact information and final tour details. Sent to you FREE by email!